As per your desktop background, you still appear to be booting off the CD. Have you followed the instructions on the Wiki to install OS 9 and remove the installer image from your list of mounted disks? I believeI have not followed the instructions on the Wiki. Are the instructions these:https://www.emaculation.com/doku.php/sheepshaver_mac_os_x_setup ? Those are the instructions You may find that you're currently somewhere around "Booting SheepShaver and installing the system" or shortly after in the process. Judging by the desktop image, you are still booting from the installer disk. You need to remove the .toast installer image from the volumes list to enable SheepShaver to boot from the installed system. hello again, I've deleted the .toast installer image from the volumes. This is what I get when I relaunch SheepShaver, does it seem correct? Im also confused on how to add a shared folder to the Sheep Shaver Desktop, advice would be appreciated. I need this shared folder because I need to copy the MacDiff installer on there, any advice would be appreciated. 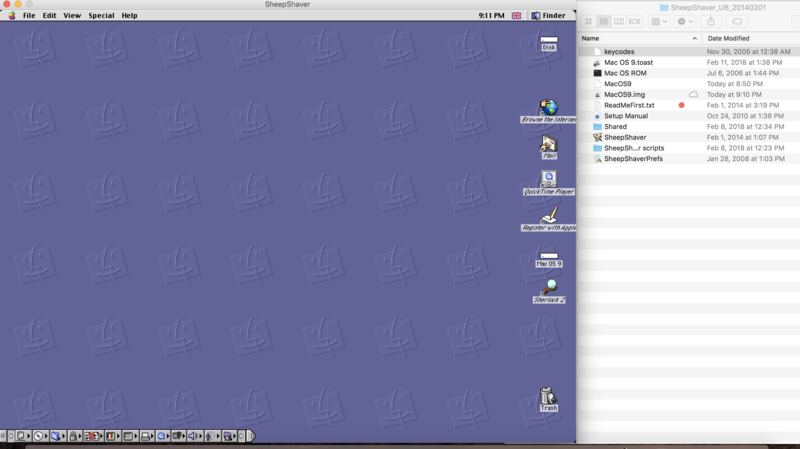 On the OSX host, create a folder in a convenient place. I would suggest on your desktop. Launch SheepShaver. Open preferences. Where it says "Unix Root", add the path to your shared folder using the "Browse…" button to find and "Open" the folder you created to be the shared folder. Click Save, and quit SheepShaver. The next time you launch SheepShaver, the shared folder will appear as a disk "Unix". 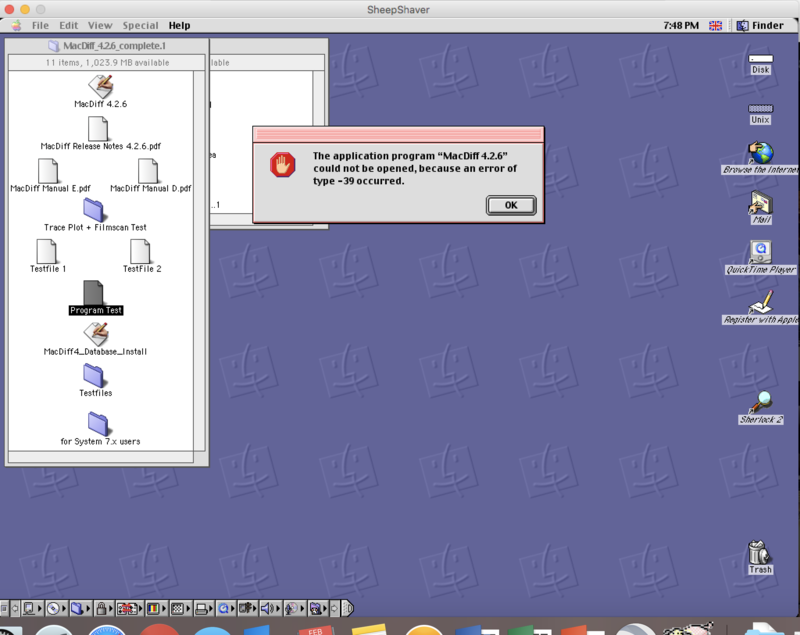 You've also currently got a disk called "Disk" that you're booting from, and a second disk called "Mac OS 9". I'm guessing that second one is an unlocked copy of the install CD? Or was that the one you intended to install to? In either case, you've still got an extra disk image loading in the preferences. The rest looks to be good as far as it goes, but you don't have the unix disk set and likely don't have networking enabled either. Maybe you did not fully understand the instructions there. More clearly: Do not try to open application files when they are still in Unix and do not move files from Unix to the desktop! Ever! First drag files from "Unix" to "Disk" so they will be copied to "Disk".